Natural Treat is a skincare and wellness company that hopes to bring more awareness to us, where our body and skin are concerned. 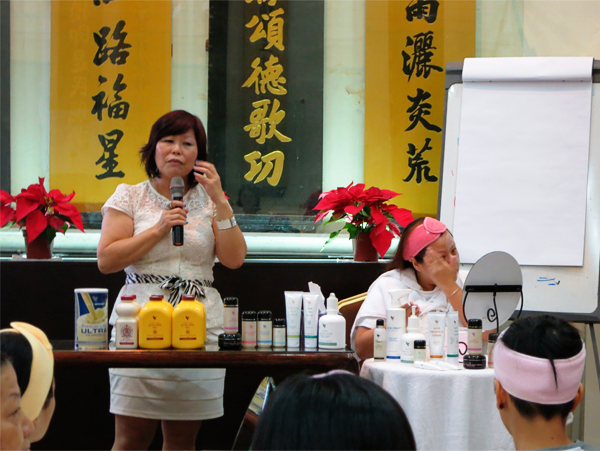 Together with Academy of Professional Aestheticians (APAes), they frequently hold workshops on facials and skincare. 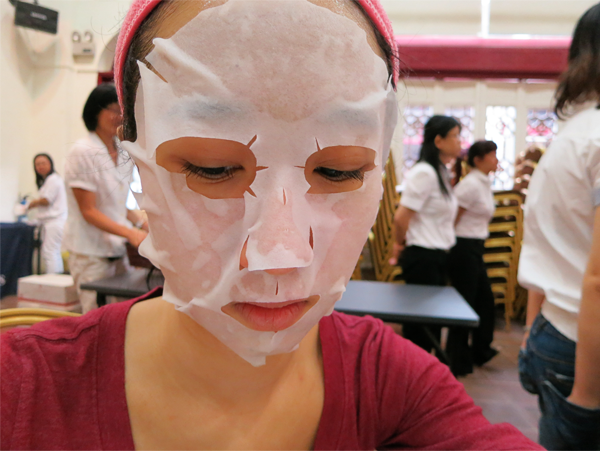 The DIY Facial Workshop is one of them. 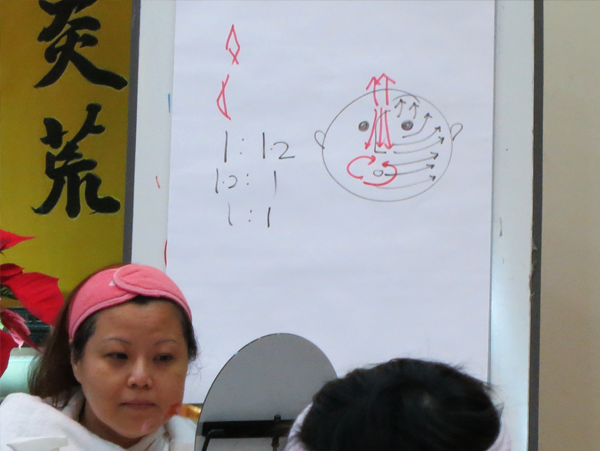 Conducted in both English and Mandarin, it is held once a month and has a maximum of 30 people. Smaller workshops of 8 people are held at the People's Park Centre. Each person was given his or her own mirror, a hairband, a basin of water (Which was frequently replaced.) and a facial sponge (Which is for yours to keep.). 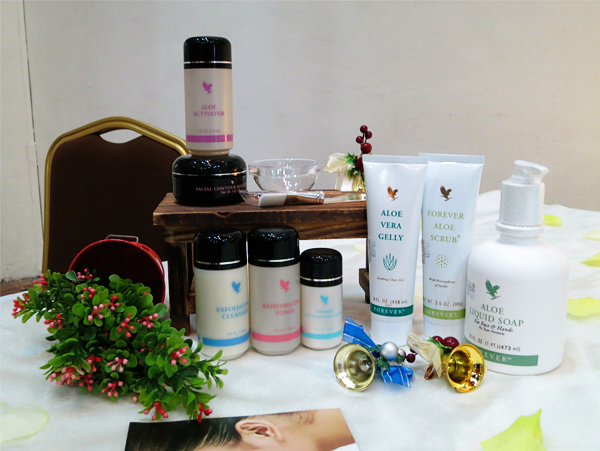 The products used were from Forever Living, whose products are made primarily from organic Aloe Vera. This American company is the world's largest Aloe Vera grower, manufacturer and distributor and has 34 years of history, with presence in 150 countries. The particular species of Aloe Vera that Forever Living grows is the Aloe Barbadensis Miller. This is the most potent species and it is listed at the top of the ingredient list (This means it has the greatest content.). This soft, gentle, alcohol-free and oil-free makeup remover removes all makeup and dirt. Pour some of this onto a piece of cotton pad and swipe it upwards, across the length of your face. Repeat until the cotton pad is clean. This gentle formula exfoliates and cleanses your skin thoroughly, removing all traces of makeup and dirt. This is a rich, luxurious, pH-balanced hand and face cleanser. It cleans without causing irritation and leaves skin feeling smooth and silky. This scrub contains small Jojoba beads that are gentle, mild and do not harm the skin. It can be used daily to remove dull dead skin cells and dirt and promote cell renewal, leaving your skin fair, smooth and with a natural glow. This duo cleanses pores, removes blackheads and white heads and tightens your skin. At the same time, it also helps to nourish and condition your skin, providing in-depth treatment and cell regeneration. This toner contains Witch Hazel that helps with the tightening of pores. It also regulates and stabilizes your skin, whilst lightening it. This gelly moisturizes and nourishes your skin. 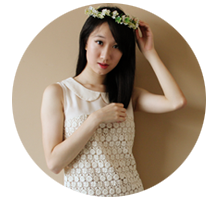 At the same time, it also helps with cell regeneration and the increment of skin collagen. It can be used to relieve itching and minor skin woes. This lightweight lotion has SPF 15 and helps to tighten and refine pores and prevent the formation of wrinkles and lines. 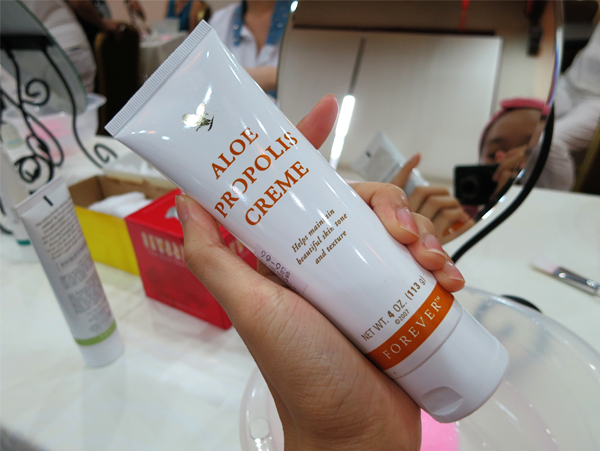 The most interesting step for me was when we used the Aloe Activator and Facial Contour Mask. When those two are mixed together, they became a paste. As it dried up, it tightened my pores and gave me a temporary face lift (Apply the paste with a brush in the directions shown above!). At the same time, it also helped to remove blackheads! 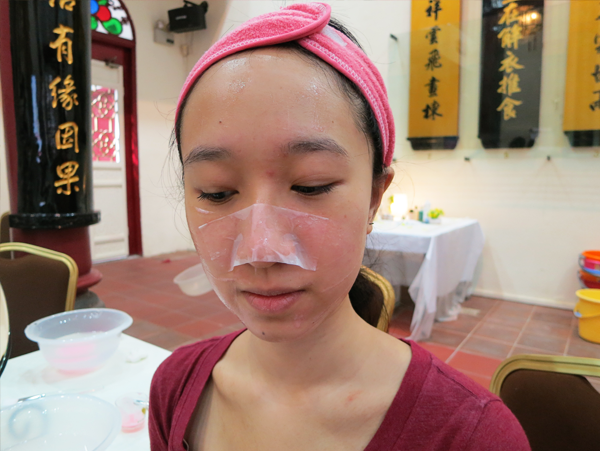 Here's a shot of me doing a DIY pore pack with the Aloe Activator and Facial Contour Mask! Here, I'm soaking in the goodness of the Rehydrating Toner! 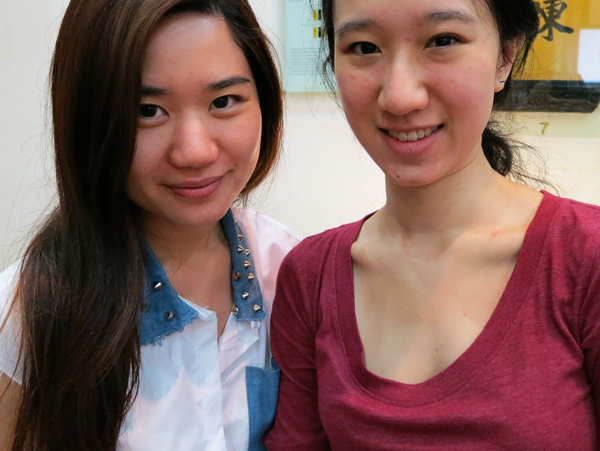 After the event, I had a chat with Jenni, co-founder of Natural Treat, and she brought me through some demonstrations. In the first demonstration, a piece of instant noodles was tinted with iodine. It was then placed first in water, then in a generic brand of Aloe Vera juice and finally, in Forever Living's Aloe Vera juice. As seen in the last photo, the instant noodles returned to its pristine condition only after dipping into Forever Living's Aloe Vera juice because it is 100% stabilized Aloe Vera, completely pure and not diluted. 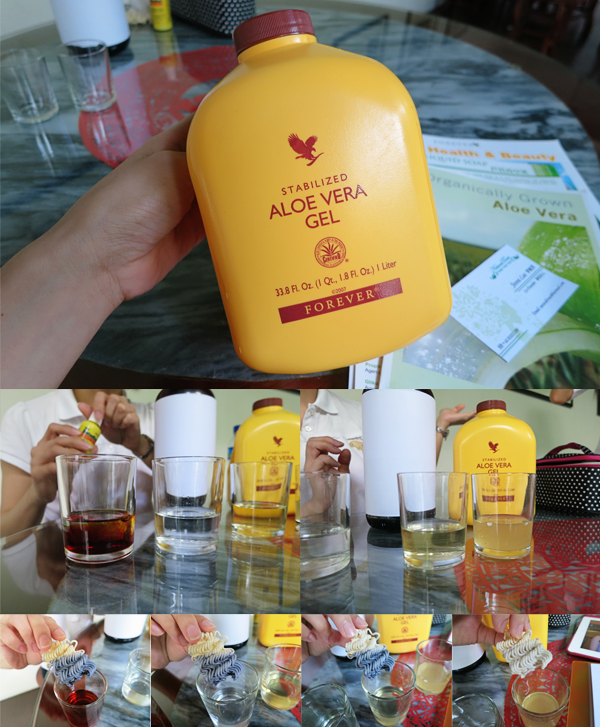 The second demonstration involved Forever Living's Forever Arctic-Sea and Omega 3 from a generic brand. The little Styrofoam bits acted as fats and they only disintegrated in the cup with Forever Living's Forever Arctic-Sea.